In 2009 the parchment of the Voynich MS was subjected to radio-carbon dating and the result was that this parchment dates to sometime between 1404 and 1438 with 95% probability. The analysis was done in the frame of an ORF TV documentary, and the public announcement was made during a press conference on 8 December 2009. The radio-carbon dating was performed by the University of Arizona, and described in some detail in an internal report. It has been publicly presented at several occasions (1), but I am not aware of a published paper on this topic. The present page is meant as an explanation of the relevant aspects of this analysis, for non-experts. It is not copying information from the internal report (except when specifically stated), but an independent explanation and calculation. All organic matter is based on ‘normal’ carbon, with a small fraction of ‘different’ carbon. This normal carbon is denoted as 12C and the different carbon as 14C, where 14C atoms are not stable. Additional types ('isotopes') exist, for example 13C, but their role in this process may be left outside the present discussion. 14C atoms decay slowly but steadily. When an organism is alive, it will tend to have the same ratio of 12C and 14C as its environment, as it is in an equilibrium with this environment, because it feeds from it (breathing the atmosphere and feeding from other organic matter). However, when the organism dies, this feeding stops, and the decay of the 14C atoms begins. This decay follows an exponential trend, such that after about 5700 years only half of the original fraction of 14C remains. By measuring the ratio of 14C atoms to 12C atoms, and comparing it with the present time, one can see how much decay has taken place, and derive how old this organic matter is. The Voynich MS has been written on parchment and parchment is made from animal skin. It can be dated based on the principle described above, and the result gives the time that the animal, whose skin was used, died. One complication in this process is, that the ratio of 12C and 14C in the environment was not constant over time in the past centuries, or millennia. This fact has been established by comparing the 14C contents of trees that could be precisely dated using tree ring analysis. A second complication is, that as from World War II nuclear detonations have generated large amounts of 14C in the atmosphere that has nothing to do with the natural decay process. As a result, the 14C content after 1950 is severely disturbed, and the year 1950 has been defined as the reference. In the radio-carbon dating world, ‘before present’ therefore means before 1950. Had complication one not existed, a very simple and smooth curve would have allowed to date any item based on its 14C contents compared to the 1950 standard. Instead, based on the tree ring analysis, reality looks very different. In the graph below, the smooth blue curve is the hypothetical relation between 14C fraction and age, while the more complicated red curve more closely represents reality reconstructed from the above-mentioned tree ring analysis (2). Both are shown for the time frame of interest for the Voynich MS, but can be used also for times much further in the past. Already in the 1970’s Prescott Currier suggested that the Voynich MS is written in two different ‘hands’ and two different ‘languages’, which he called ‘A’ and ‘B’. The difference is most visible in the herbal section of the MS. The different hands/languages could be from two scribes, or from one scribe at very different times. It was decided that it would be important to have at least one sample from each. Furthermore, a small number of folios have been observed to be clearly thicker than others, for example the bifolio 42 + 47. As this could indicate a different batch of parchment, it was decided to include a sample from this thick bifolio. The manuscript is particular in that it has quite a number of oversized foldout folios. It is clearly of interest to include a sample from one of these. The ex libris of Tepenec (around 1608). Instead of the heavily stained folio 1, one could use the other part of the bifolio, which is folio 8. A castle in a style used only after ~1300 (on the so-called rosettes page). The library did not wish this folio to be damaged. Following are the measured 14C content of the four samples as presented by G.Hodgins during the Voynich MS centenary event in Villa Mondragone on 11 May 2012. The error distribution of these measurements is assumed to be Gaussian and the sigma (standard deviation) of this distribution is also given. This standard deviation is based on the uncertainty of the measurement process (3). This shows in a very visual, yet qualitative way that the four measurements are consistent. There is no indication that the samples represent a different age. The unweighted mean of the four observed values in the Table above is 0.9379, and the standard deviation of these four values is 0.0030. While a standard deviation of only four samples cannot have a high level of confidence, the value is well below the standard deviation of the individual measurements. In other words: the spread of the measurements is less than their inherent error. This quantitatively confirms the consistency of the measurements. The red curve above, showing the relation between 14C fraction and age, was published by Reimer et al in 2013 (see note 2). 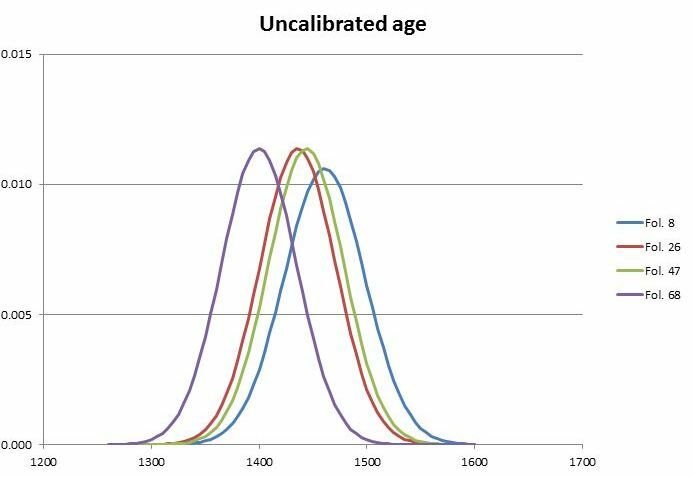 This publication presents the relationship between un-calibrated age and calibrated age, where the un-calibrated age is derived from the 14C fraction using an exponential decay with a half life of 5568 years (4). The practical advantage of using un-calibrated age instead of 14C fraction is that the relation between un-calibrated and calibrated age is close to linear over the full range of its validity, going back tens of thousands of years before present. Apart from that, the quantity un-calibrated age is not particularly meaningful by itself. In this case, the mean and standard deviation of the four measurements are 1435 and 26 years respectively. 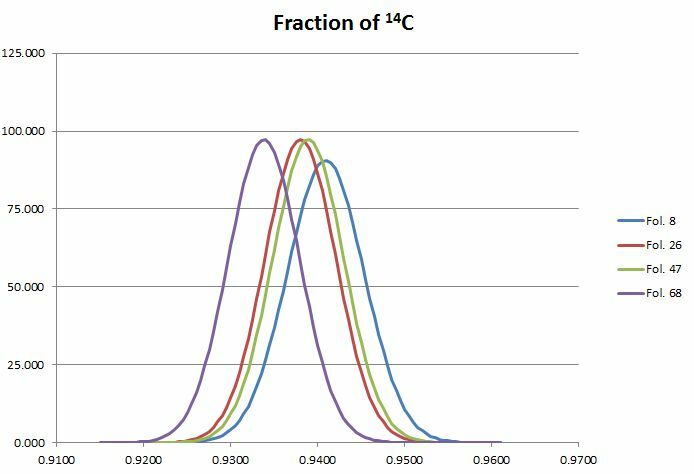 However, both the measurement of the 14C fraction and the calibration curve have their uncertainties or errors, which need to be taken into account. Let us look at the uncertainty or error of the calibration curve first. The uncertainy is expressed as the standard deviation (sigma) of the 14C fraction as a function of the calibrated age (5). The following graph shows the calibration curve with plus or minus one sigma. This means that there is 68% probability that the 14C fraction corresponding to the calibrated year lies between the two green curves. This curve isn’t exactly Gaussian anymore, and there is a 95% probability that the age of this folio lies between 1409 and 1429. However, this still does not take into account the uncertainty or error in the measurement of the 14C fraction. The effect of this may be visualised by showing the probability distribution of this measurement to the left of the vertical fraction scale. This is nothing else than the maroon curve shown higher up on this page. The calculation to take this into account becomes a bit more complicated (6), but the result is shown below for all four folios (7). The double peak is caused by the fact that part of the probability curve of the 14C fraction also intersects with a local maximum of the calibraton curve around the year 1335. The 95% probability interval lies between 1404 and 1435 (8). The higher limit deviates somewhat from Hodgins’ publication, but the simplifications that were made in the interpolation and integration steps are not believed to be significant (9). They have also been repeated with three different calibration curves: IntCal04, -09 and -13. This did not have any visible impact on the result (10). The above figures for the probability distributions for the individual folios and the combination cannot be distinguished visually from those in the internal publication. The above describes the process used by the University of Arizona, and delivered to Yale. It was first summarised during the press conference mentioned in the introduction, together with a summary of the chemical analysis of the inks and pigments in the MS. Unfortunately, at this event, a statement was made that the analysis had demonstrated that the inks were applied immediately after the MS creation, but this statement was incorrect. The analysis did not provide any information about this. Specifically, the radio-carbon dating process desribed above provides the date of the parchment creation, with a probability of 95%. There's still a (statistical) probability of 5% that the date is outside this range. One is of course more interested in the time that the MS was written. There is an unknown time between the creation of the parchment, and the time that the author(s) started applying the ink to it, and another unknown time for the author(s) to finish the work. Furthermore, there may be later entries in the MS, possibly by later owners (for example the month names in the Zodiac section), though these are of less consequence for this question. At the time when the radio-carbon dating was published, it was already clear that many of the proposed theories about the origin of the MS were highly incompatible with these results, and presently I am aware of at least three new theories that propose much more recent dates for the MS. The authors of these theories then either need to argue that the above result is incorrect, or that the parchment must have been preserved unused for one or more centuries. While that is not impossible per se, we need to keep in mind that for the dating we are talking about a 95% proability range, and it is clear that such scenarios are way outside this range. Similar to the Voynich MS, the Vinland map has been subjected to 14C analysis and it may be of interest to also present these results. All information is taken from Donahue et al. (2002) (11). The map itself consists of only one sheet, and several samples were taken from this sheet. These samples were processed sequentially, but all with different preparation (cleaning) steps. The paper states that each of the individual measurements is essentially consistent (to the level of their uncertainties) with this average, which is statistically correct, even though it is not intuitive from the above graph. At least it could be established that the parchment on which the map is drawn predates Columbus' voyage to the Americas. I am grateful to the Velinska family for feedback on the original text. I could hopefully make the text understandable for people with different levels of knowledge about statistics. Zyats, Hodgins and Barabe, The Mysterious Voynich Manuscript: Collaboration Yields New Insights. American Institutes for Conservation’s 40th Annual Meeting, May 8–11, 2012, Albuquerque, New Mexico. Also presented April 2014 in Copenhagen and July 2014 in Philadelphia. This graph represents the so-called IntCal13 radio-calibration curve from: Reimer et al: IntCal13 and Marine13 Radiocarbon Age Calibration Curves, 0–50,000 Years Cal BP; Radiocarbon, Vol 55, Nr 4, 2013, pp. 1869–1886. Information taken from the internal publication, and from priv. comm. with G. Hodgins. The figure 5568 does not represents the most accurate value for the half life of 14C, but it is one of the first estimated values, which has traditionally been used in the process described here. The standard deviations, published as part of the calibration curve data, derive from the tree ring analysis process. Tools to make this calculation are publicly available, but I performed this calculation using MS Excel. These curves cannot be distinguished visually from the ones published in the internal paper. The limits are those where 2.5% of the distribution lies outside. The calibration curve is given at a 5 year step for the time frame of interest. The values have been interpolated smoothly between these years, and assumed constant over each year. For each sample, the un-calibrated age probability distribution has been sampled at 1-year steps and also assumed constant over each year. The result is almost identical with earlier calculations made with a coarser approach. The IntCal04 calibration curve was published in: Reimer et al: IntCal04 Terrestrial Radiocarbon Age Calibration, 0–26 Cal kyr BP; Radiocarbon, Vol 46, Nr 3, 2004, pp. 1029–1058. This curve was used in the analysis by Hodgins (as taken from the internal publication). Donahue, Olin and Harbottle: Determination of the Radiocarbon Age of Parchment of the Vinland Map, Radiocarbon, Vol 44, Nr 1, 2002, p 45–52. Taking the weighted average is a different way of combining the data than was used for the Voynich MS. The weight of each measurement is 1/sigma.